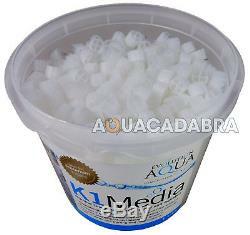 Evolution Aqua K1 Kaldness Media - 1L, 5L, 25L, 50L - for Static or Moving Bed. Kaldnes K1 Media - Moving Bed Process. Please use the drop-down menu to select your preferred size. The following options are available from Aquacadabra. Maturing the Kaldnes bio-media is important because a delicate eco-system is naturally developing for the bacteria involved in the nitrification process. Kaldnes media provides the maximum active surface area for the bacteria to colonise, more than other types of static media. It is this process which removes harmful ammonia and nitrite from the water. How it is different to other media. As the Kaldnes media moves within the filter, it causes the old dead bacteria on the outside to be displaced. This makes space for new younger heavier feeding bacteria to rapidly colonise. Within the wheel is a protected surface which enables colonies of bacteria to naturally follow their lifecycle, of maturing, dying and then fueling the latter stages of the nitrification cycle. Kaldnes has been designed to provide the best possible habitat for both young and mature beneficial bacterial colonies. What is meant by'self-cleaning'? Unlike foam, matting, or other forms of static filtration media, the Kaldnes K1 media is designed to move freely within your filter. The constant chaotic movement of the air from your pump, causes the media to self-clean and thus requires no maintenance. This allows the filter to reach optimum effectiveness without the disturbance of periodic cleaning, avoiding unnecessary loss of bacteria within the filter. 50 Litres of K1 media will handle up to 250 grams of food per day. For all your aquatic, reptile & other pet needs! Also post-codes AB 30-38 and AB 44-56, FK 17-21, G83, IV 1-29 IV 30-32 and IV 33-39, KA 27-28, KW 15-99, PA 20-99 PH 17-32 and PH34-38, PH 33, PH 49-99, TR 21-25 AND ALL ZE POST-CODES. Unfortunately couriers pass on aditional shiping charges for these locations which we have to pass on. There are many reasons to shop online with Aquacadabra. Having traded online for so many years, we were one of the original specialist online aquatic retailers. As such, we have a huge wealth of experience in online trading. At present we list nearly 5,000 specialist aquarium & pet products suitable for Aquatic, Reptile, Cat and Dog enthusiasts. All our items listed are UK spec. We're not just an online aquatic retailer, we are also a specialist aquatic retailer with a bricks and mortar warehouse located in Crayford, Kent, and you are very welcome to visit. Open six days a week and staffed by experienced aquarists with a love for the hobby, our staff don't just manage the welfare of our live stock on site, many also have tropical and marine aquariums at home. It is only by being enthusiasts for the hobby that a true understanding of fish husbandry can be obtained, whether it is understanding the requirements of your fish or knowing the appropriate piece of equipment that you require to succeed in the hobby. One final reason to shop with Aquacadabra is our inventory. When placing an order with us, you can rest assured we'll have the goods with you as quickly as we possibly can. We feel that offering a large inventory of products at competitive prices, tied to a high level of customer service and the reassurance that we are available for you 6 days a week for any fishy questions that you may have, Aquacadabra is the one stop shop for all of your aquatic reptile or pet needs. If an item over the specified value/weight is ordered to one of these locations, you will be subject to a 6.90 surcharge from our courier. Our website features an extensive online Help section which covers all eventualities with orders; together with easy to complete forms to enable us to address any problems in as quick an efficient a time frame as possible. The item should be in an unopened and unused condition and you should notify us within 14 days that you wish to return the item to us. Please be aware that after bank holidays there is always a back log of orders for us to work through. Usually this is due to a courier being unable to locate an address, and unfortunately problems can from time to time be encountered when using any third party courier service. Please note that should a parcel be lost it takes 14 days before we can claim for the lost parcel. We will discuss the matter directly with you to ensure that you receive the minimum of inconvenience. Please do not send any faulty items to us directly as this may cause a significant delay in resolving the matter. We aim to resolve this type of problem in as timely a manner as possible. There are a number of circumstances when you may wish to cancel and/or return goods ordered. Once the Company has received and acknowledged your requirement, they will provide you with the necessary procedure which you must ensure is followed. Please also note it is your responsibility to get the item back to us at your cost in a new undamaged condition. When returning goods, we recommend that you use a courier or deliver them personally to our Head Office. The Company accepts no responsibility for damage that is incurred in transit when returning goods, or for goods that are lost in transit. Order Cancellation or Changes to Orders. Once an order has been placed it will be processed almost immediately. This means if you wish to cancel the order you will need to send the goods back to us once received. This listing is currently undergoing maintenance, we apologise for any inconvenience caused. 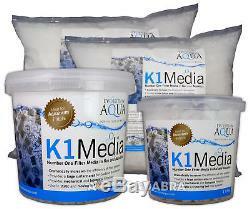 The item "Evolution Aqua K1 Kaldness Media 1L, 5L, 25L, 50L for Static or Moving Bed" is in sale since Saturday, July 13, 2013. This item is in the category "Garden & Patio\Ponds & Water Features\Pond Filtration Equipment". 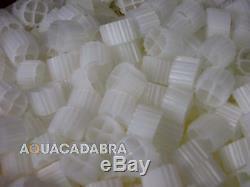 The seller is "aquacadabra" and is located in bexleyheath,kent. This item can be shipped to United Kingdom, Austria, Belgium, Bulgaria, Croatia, Cyprus, Czech republic, Denmark, Estonia, Finland, France, Germany, Greece, Hungary, Ireland, Italy, Latvia, Lithuania, Luxembourg, Malta, Netherlands, Poland, Portugal, Romania, Slovakia, Slovenia, Spain, Sweden, Australia, United States, Russian federation, Canada, Japan, China, Israel, Hong Kong, Norway, Indonesia, Malaysia, Mexico, Singapore, South Korea, Switzerland, Taiwan, Thailand, Chile.